The half chicken, weighing over three pounds, once clucked and scratched and wandered around our small farm. The lemons hang abundantly on my neighbor’s tree, and they are delighted to share with everyone on our street. The rosemary and garlic grows feet from the house. Only the potatoes, olive oil, red pepper flakes and salt came from parts unknown or far away. When we sat down to our roasted chicken dinner and fresh lettuce and spinach salad (grown in our sheltered patio garden), we took comfort in the fact that we knew where our meal came from, how it was grown and the humanity and gratefulness that accompanied its processing. It’s a wonderful thing to know that you can feed yourself, and not just any ole thing, but a succulent, nutritious, organic meal. That is truly a sense of freedom, folks. Use a vegetable peeler and peel rind off the lemon in long strips. Be careful not to get the bitter white pith. Cut lemon in half and juice ½ into a small bowl then mix in chopped rosemary, minced garlic, red pepper flakes, black pepper and 1 tsp of salt. Rub mixture all over chicken. Place in roasting pan and cook for about an hour. After an hour, toss potatoes in olive oil to coat. Squeeze other lemon half over. Sprinkle with salt and pepper and arrange around chicken. 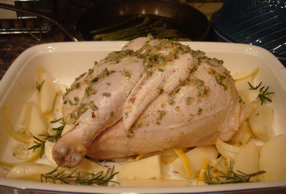 Spread lemon peel, whole rosemary sprigs and smashed garlic around and return to oven. Continue cooking until chicken is done and potatoes are baked. NOTE: since I’ve been raising and cooking my own chickens, I’ve noticed that homegrown chickens take a bit longer to cook than store bought. I don’t know if it’s the denseness of the meat on homegrown or the fact that many commercial poultry processors “pump” their birds so they will be juicy. Whatever the reason, my birds seem to take longer to cook fully, but they are well worth the wait. Just plan ahead.